SQUEEZE & STRETCH™ TRIPLE PLAY comes with all three: Soft, Medium and Hard SQUEEZE & STRETCH™ and their Plugs. This is a great system to for anyone to train and stretch their upper body. The Triple Play gives the owner all the different levels plus the ability to use multiple units at a time for even more unique exercises. SQUEEZE & STRETCH™ TRIPLE PLAY gives you the ability to advance. By having all three of these great portable workout tools you can progress from one level to the next or you can share them with your friends and family. Use them alone or in combinations. With a little imagination you will be able to create your own custom exercises and stretches. Use them to relax your sore hands or neck. 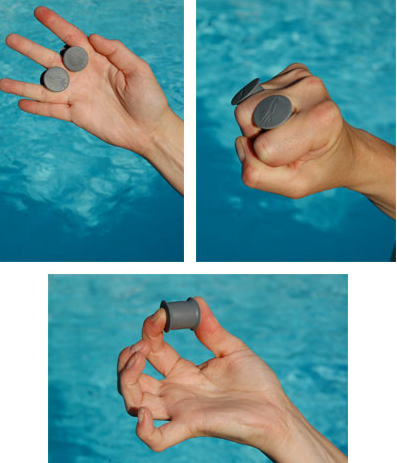 Use them to strengthen your grip, wrists and arms. All this in a set of products that will fit in your pockets and you can use anywhere. SQUEEZE & STRETCH™ TRIPLE PLAY unique patented IRONWEAR™ design provides the widest range of both compression and tension exercises available plus the ability to double or triple the compressive range by using multiple units together. The elongated elliptical shape allows you to choose the amount of material you wish to compress from one to four inches. Multiple SQUEEZE & STRETCH™ units can be stacked to provide you with even more resistance levels for your compression exercises. SQUEEZE & STRETCH™ TRIPLE PLAY unique special plugs can be left in for maximum resistance or one or two can be removed for lower levels of resistance. So instead of one level you get three levels of resistance in each unit for a total of 9 possible resistance levels. 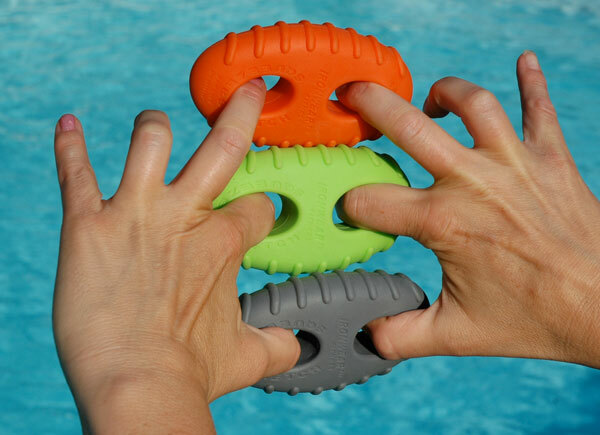 To try to match all these options you would have to purchase a couple dozen squeeze balls and still you would not have the range of thickness and resistance provided by the SQUEEZE & STRETCH™ TRIPLE PLAY. SQUEEZE & STRETCH™ TRIPLE PLAY unique holes can be used for a wide variety of tension exercises. One or more fingers can be inserted into each hole and instead of compressing, the SQUEEZE & STRETCH™ can be stretched to work the muscles of the hand, arms, shoulders, neck and other parts of the body. With two or three units you can stretch more ways at that once fun even more fun. SQUEEZE & STRETCH™ TRIPLE PLAY unique soft material allows you to use the devices directly against your body to work sore muscles in your back, shoulders and neck. You will find there are a hundred plus exercises and stretches that you can do with your SQUEEZE & STRETCH™ TRIPLE PLAY. SQUEEZE & STRETCH™ TRIPLE PLAY unique Thermal Properties allows you to pre heat or pre cool them easily and then use the devices to relax sore joints and muscles while working soothing heat or cold into the area. Multiple units let you alternate between different temperatures. For example put one in hot water and one in the icebox for a few minutes, then switch between hot and cold to work sore muscles and joints of your fingers, hand and neck. Soon you will find a hundred ways to use your SQUEEZE & STRETCH™ FULL HOUSE. SQUEEZE & STRETCH™ TRIPLE PLAY comes with one Soft, one Medium and one Hard SQUEEZE & STRETCH™ with Plugs and will give you hours of exercise pleasure. 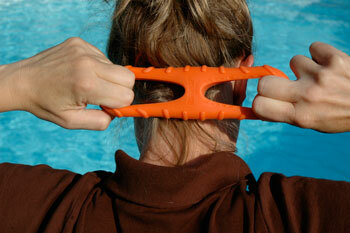 SQUEEZE & STRETCH™ TRIPLE PLAY also makes a great gift for all ages.